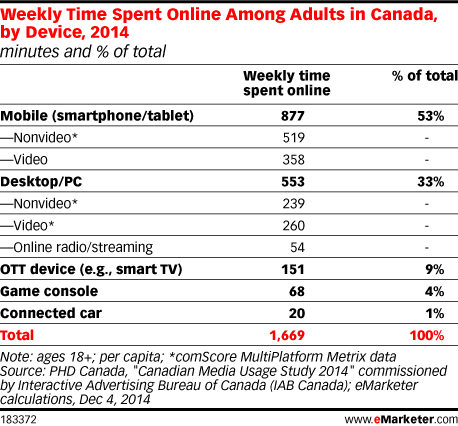 Data is from the December 2014 PHD Canada report titled "Canadian Media Usage Study 2014" commissioned by IAB Canada. Weekly reach and time spent (per capita) with media from multiple sources were gathered and analyzed by PHD Canada to estimate time spent online. This includes: Numeris' 2013/2014 PPM that tracks TV time spent; Numeris' Fall 2013 Diary that tracks radio time spent; NADbank's 2013 telephone survey of newspaper time spent; 2014 Spring PMB in-person survey for magazine time spent; and comScore's July 2014 Multiplatform Metrix. In addition, device penetration data was gathered from Media Technology Monitor's Spring 2014 survey.